In the building trade, the ceiling is referred to as ‘Lionel Richie’s dancefloor’. It was never completely clear on ‘Dancing on the Ceiling’ where Richie was. 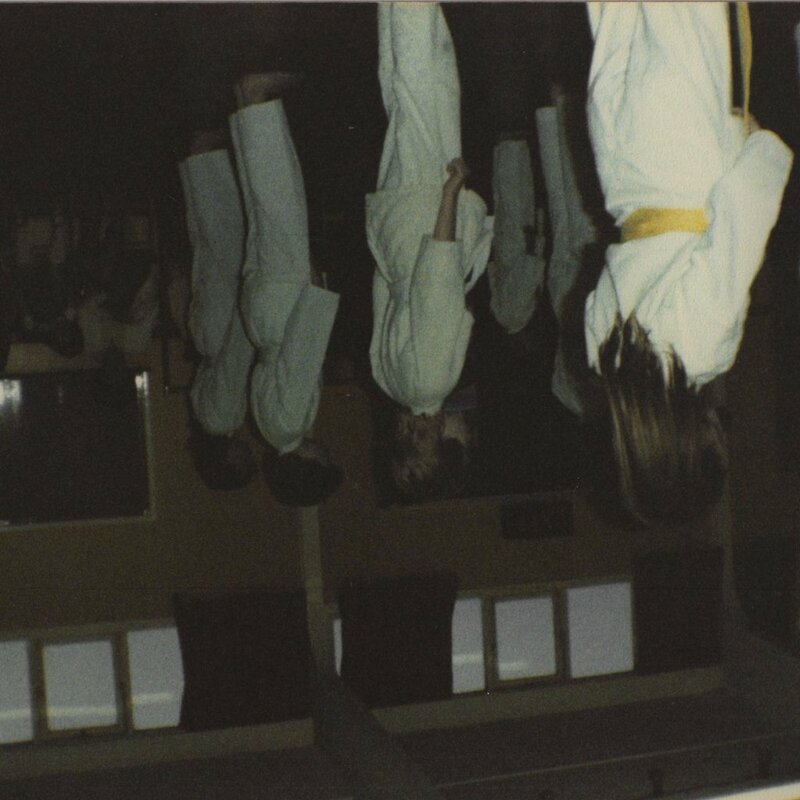 On top of the ceiling, or somehow gyrating whilst upside-down? Perhaps it was just a metaphor. On Jaws’ new album ‘The Ceiling’, the title track declares, with Richie-like self-assurance, “When I’m up here, I feel like I can do anything.” And to be fair to the lads, that bears true on the rest of the album. It seems like anything goes. They’re happily unfettered by genre, and without suggesting that they completely roam free (trap, grindcore, Mongolian throat singing) their eclecticism brings pleasing variety. It’s potentially easy to lump ‘The Midlands’ together under one broad descriptor, like many people I know talk of ‘The North’ (pretty much anywhere up the M5 from Gloucester), but Jaws are from Birmingham, and Birmingham and Stourbridge are only fifteen miles apart. It’s perhaps unsurprising, then, to hear a certain strain of The Wonder Stuff in Jaws’ work. The album’s opener, ‘Driving at Night’ starts with a ‘She Bangs The Drum’ beat, quickly followed by a distinctly lairy, snarling Miles Hunt vocal, leading into a final minute of jagged Ride/Wedding Present shred. It’s an exhilarating start, and a tough act to follow, rather like putting your headliner on first and expecting people to stay for the support afterwards. What does follow is a curious assembly of tracks, as if someone’s hit ‘shuffle’ on a music library stocked with well-curated 80s/90s/00s tunes. One exception to this chronology is track two, ‘Feel’. Having posed the ‘How do you follow the opening track?’ question, the answer turns out to be ‘Do a track that sounds like recent Coldplay’. You could certainly imagine Chris Martin doing that foot-to-foot bounce dance (like small kids do when they need the toilet) to this one. It even has the drum ending of ‘Every Teardrop Is A Waterfall’. ‘Do You Remember’ carries a strong Cure guitar line, as well as an early-90s wall of guitar sound. There’s a similarly reverby aspect to the guitars on ‘End of the World’ almost a Gothic Simple Minds sound, with a couple of minutes of stadium rock at the end. To then hear ‘Patience’ begin with a flute reminiscent of ‘The Bird’s Theme’ from Peter and the Wolf, quickly merging into Bastille/Everything Everything indie-pop, proves to be a stark juxtaposition. ‘Fear’ has that chilled Iberian, beachy ambience that you immediately get in landlocked Brum. The Factory/Haçienda Andrew Weatherall dance beat makes it a 4AM floor-filler. On a similar theme, we’re told on ‘Looking/Passing’, “I want to dance like I don’t care… but everybody’s watching.” Despite those lyrics summing up something we’ve all felt at some time in our lives, it doesn’t seem to be where Jaws are at in 2019. They seem fearless. Indeed, on ‘The Ceiling’, they sing, “Just keep going; there’s no ceiling.” Where that leaves Lionel Richie, God only knows. The Ceiling is out now through Jaws.